Author: Sophia Thubauville. Series edited by: Thomas Bierschenk, Anna-Maria Brandstetter, Raimund Kastenholz, Matthias Krings, Carola Lentz. The Maale (also: Male) are an ethnic group located in the Omo region of southern Ethiopia. The present study deals with the situation of the Maale women and analyses the options they have in the patriliear society they are living in. On this, the author predominantly evaluates her own monitoring of and interviews with the Maale women she could build up mutual trust to during her recurrent fieldwork in the region. Illustrated with excerpts of the interviews and her fieldwork diary, reports from the women as well as numerous photographs, the author analyses to which degree the life of the Maale women is shaped by the tradition of their society as well as by the influence of modern spirit and cultural change. During the last years, the number of female anthropologists increased. However, only male anthropologists have done detailed studies in the Maale region and the few female researchers who published their analyses did either only marginal fieldwork or didn’t focus on the women’s life. Sophia Thubauville started to do her fieldwork among the Maale in 2003. Between June and November 2003, she lived three months in southern Maale to analyse material culture in its ritual context. The resulting findings of this research formed the groundwork for her foregoing master thesis. 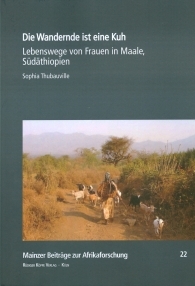 Since June 2006, she spent 19 months of intensive fieldwork in the South of Ethiopia and in this context focused mostly on the analysis of female paths of life. From 2009 to 2010 she worked as a co-director of the South Omo Research Center in Jinka, South Ethiopia. The author presents the results of this research in the study on hand which constitutes the first detailed contribution of a female anthropologist concerning Maale women’s lives and states a reasonable addition to the existing publications. Based on fieldwork mainly in 2006 this study on the life cycle of Maale women shows how their lives are marked, strenghtened and guided, and the importance of numerous rules of avoidance accompanying every phase of life. The description includes tensions between traditional avenues of action (agency) and changing life patterns, resulting from far-reaching change in Maale society. The description includes many statements of interviewees (of altogether 56 interviews), there are many photographs and drawings, maps, and a number of stories illustrating Maale culture. The Maale, as Sophie [sic!] Thubauville’s remarks in her contribution, next to other south Ethiopian groups, have already been studied by a number of anthropologists. Thubauville, however, choses a different focus for her research – the life circles and life histories of women in Maale – following the trend that emphasizes gender related subjects in Ethiopian studies. [...] the publication is a very important contribution to anthropological gender studies in Ethiopia and moreover to anthropological studies on the Maale in general, as it fills a gap in research, which was long overdue.